Darla Carter of the Courier-Journal tells the story of Keisha Dalton, who was 30 when she noticed blood in her stool after eating spicy food and thought it was from hemorrhoids, but learned through a colonoscopy that it was cancer. “I never thought in a million years that I would have colon cancer,” the Louisville mom told Carter. But she did. The upward trend deserves attention, say the researchers and the Colon Cancer Prevention Project, which says one in seven colon cancer diagnoses are among people under 50. The CCPP stresses on its website that everyone needs to be aware of the signs and symptoms of colon cancer and that providers must get an accurate family history “long before the age of 50” to make sure that people with a family history of colon cancer get screened earlier. The study examined about 500,000 cases of colorectal cancer from 1974 to 2013. breaking down the cases by five-year age groups and by year of birth. The research does not explain the reasons for this increase in young people, but the report says increased obesity rates, poor diets, and lack of exercise are likely contributors. And because many young people like Dalton attribute rectal bleeding to hemorrhoids and routine screening is generally not recommended for most people under 50, these cancers are often in more advanced states when they are discovered. The ACS says people under 55 are nearly 60 percent more likely than older adults to be diagnosed at a more advanced stage than those 55 and over. The good news is that colorectal cancer rates for those older than 50 have fallen by 32 percent since 2000, while deaths from the disease fell 34 percent, likely due to increased screening, which detects and removes precancerous polyps, according to a separate study by the ACS. This separate report notes that while every state saw a drop in colorectal cancers rates among people aged 50 and older, the slowest declines were seen in states with the highest rates, like Kentucky, which leads the nation in the incidence of colon cancer and ranks No. 4 for deaths from it. The study authors recommend that because of this study, screening should be considered before age 50. The ACS said it is considering this suggestion. Meanwhile, Dalton told Carter that she now educates others about colon cancer and encourages people to have open discussions with the provider, even if they are embarrassed by their symptoms or think they are too young to get cancer. 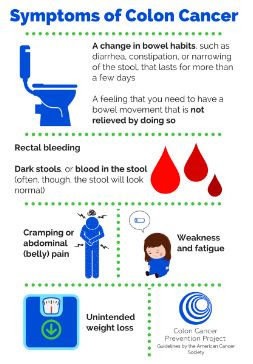 Early colon cancer often has no symptoms, but if there are symptoms, they may include: change in bowel habits, rectal bleeding, cramping or abdominal pain, weakness and fatigue and unintended weight loss, according to the ACS. The CCPP says you can reduce your risk of colon cancer by staying active, reducing or eliminating red and processed meat, maintaining a healthy weight and stopping smoking.